We’ve got another contest for you this Christmas. Debbie Mumford stopped by to tell us a little about herself. 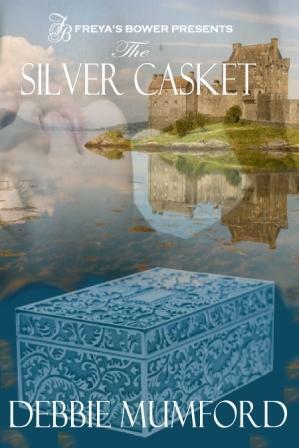 And, she has agreed to give one lucky reader a copy of The Silver Casket. Romantic Journey: Thanks for taking a few minutes out of your holiday preparation to chat with us. How did you first get published? Debbie Mumford: My first published piece was a children’s story in an ezine. I actually published several short stories in online venues before I found Freya’s Bower. Credit for that connection goes to Romance Divas! I joined RD, and a couple of weeks later saw an announcement of a new e-publisher that was asking for writing samples. I sent one in and was contacted in a matter of hours. Talk about thrilling! Freya’s Bower asked me to write two related short stories to help them launch. 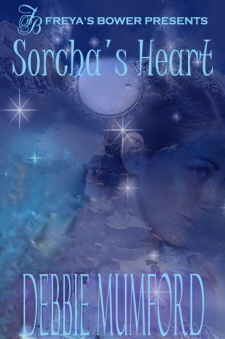 After that, I submitted a novella, Sorcha’s Heart, and the rest is history. DM: Well, I did until the current recession hit *sigh* I’ve been a technical writer in the land use / land planning field. DM: When I was employed, I got up at 5:30 a.m., wrote for an hour, and then prepared for my day at the office. Now my schedule is a bit more relaxed, but I’m still a morning writer. I prefer to get my pages done before I move on to other things. RJ: What is the biggest blooper you’ve written? DM: Oh! My first published novel, Second Sight, was a nightmare. I wrote it during NaNoWriMo one year, and almost gave up on it before it was in marketable condition. I have my Freya’s Bower editor to thank for its continued existence. If she hadn’t encouraged and poked and prodded, I’d’ve given up on the sucker. RJ: And what line that you’ve written continues to amaze you? Being bodiless, I was beyond the rush of chemicals we understand as emotion, but I watched with sublime awe as the dragon who had taught me to accept myself transformed into the faery I would have loved. DM: Oh, wow. You’re limiting me to five? The Lord of the Rings by J.R.R. Tolkien – Tolkien taught me that faery stories aren’t just for children, that fantasy is ageless. The Harry Potter series by J.K. Rowling – Rowling taught me to accept the magic in my soul. White Lies by Linda Howard – one of her early romances that caught my heart and taught me to love the romance genre. Any of Nora Roberts’ fantasy trilogies – Nora has taught me many things, but I love how she manages to blend fantasy with romance in a contemporary setting. Amazing. Yes, I know. I cheated. That’s a lot more than five books, but honestly! I was a reader long before I was a writer. RJ: The Silver Casket includes time travel. What drew you to the concept of time travel? What inspired the love story? DM: I love time travel stories. I think the first one I ever read was “A Connecticut Yankee in King Arthur’s Court” by Mark Twain. I love them when the heroine is taken back in time, as she is in The Silver Casket, and I love them when the hero comes forward in time, as in the movie Kate & Leopold. The imbalance in societal values and general knowledge of the world provides such wonderful intrinsic conflict. I’d always wanted to try my hand at one. As to the love story, well…that one is pure wish fulfillment! RJ: Christmas-themed romance stories—love them or leave them? DM: Who doesn’t love a romance involving snow, and holiday lights, and warm, cozy nights curled in front of a crackling fire? I like romance at any time of the year! RJ: If your ship were sinking and you could grab one thing on the way to the lifeboat, what would it be? Go on instinct here; don’t let common sense interfere with you as you grab your hairdryer or laptop instead of food to take to the desert island. DM: My laptop, of course! Who cares that the battery will die in hours? I’m sure my own personal Robinson Crusoe will figure out a way to power it once we reach the desert island. I’m nothing if not optimistic! RJ: Thanks again, Debbie. It was great findingout more about you and your work. The winner will be announced 2 January. Entry deadline is 11:59 p.m. UTC on 1 January, 2010. Thank you for the interview with Debbie Mumford and thanks to Debbie for sharing. I enjoyed learning more about her and her writing. I enjoyed the interview. This book sounds great; I like reading about time travel. I already subscribed via email feed. Heheh, I would grab my Mp4, because its battery lasts more than my laptop’s! I’ve enjoyed a lot this interview! Please count me in your contest! Oooo…Thanks to everyone who’s commented and twittered! What fun. Great interview! It sounds like an interesting book. « What’s the Highest Compliment You Can Give a Book?